The beauty of a flower meadow, packed with fragrance and colour, is an idyllic summer setting. Imagine having an acre of land to meander through, picking blooms at will to create a bouquet of beautiful flowers, and even better, you can pick the flowers safe in the knowledge that they are sustainable and ready for cutting. It sounds like a perfect afternoon – it is! Such a place does exist right on our doorstep. Growing cut flowers for those who want to enjoy organic, beautiful blooms is the passion of two local businesswomen – Jen Stuart-Smith and Bek Bibby. Together they run ‘Blooming Green’ on Loddington Farm, Linton. It is a labour of love for these cousins who are the first in the country to grow cut flowers for the public to ‘Pick their Own’. 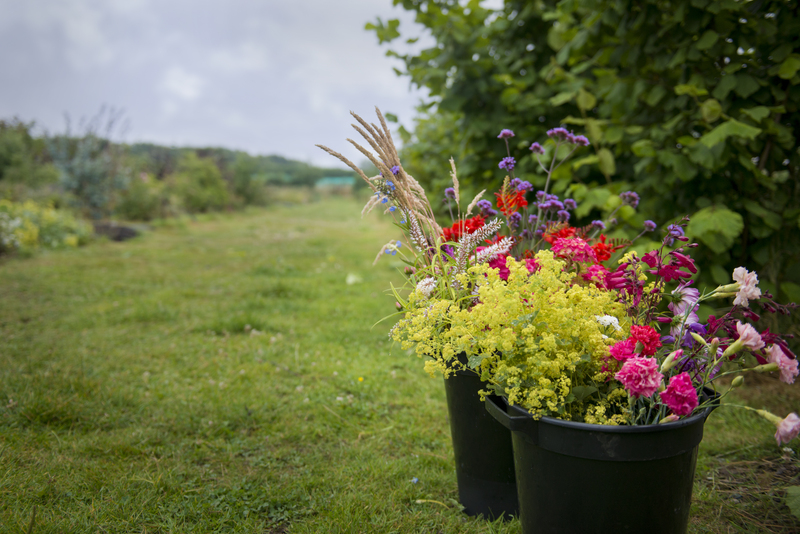 Every Friday afternoon (12pm – 5pm) from 4th July through to 10th October, Blooming Green is opening up its flower-filled acre of land for all to pick to their heart’s content. You can pick your way through the vast array of blooms which Bek’s skilful hands have grown. You will find treasures such as vibrant fuchsias, our native feverfew, tall and slender sweet peas, delicate myrtle and poker straight agastache amongst foliage and herbs such as mint, dill and rosemary. This is not floristry – it is botany and art combined. 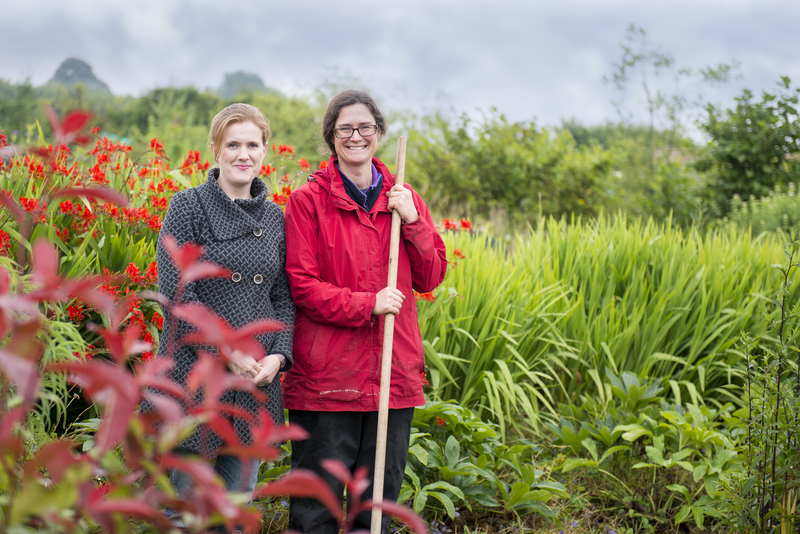 Jen and Bek plan their acre of cut flower varieties afresh every year and already welcome the public to ‘pick by appointment’. Since Blooming Green opened their acre of joy they have found ample kindred spirits – brides who want to pick their own bouquets, those who want a personal feel to their wedding or anyone who loves the idea of picking their own flowers for the table. Both Bek and Jen grew up on farms with a love of the outdoors. Bek studied environmental biology at Manchester and went to CAT (Centre for Alternative Technology) for 1 year, and Jen has had a keen interest in flowers since the age of 12 when her father bet her £5 to win the local flower arranging show. Jen won ‘Best in Show’ and hasn’t stopped flower arranging since! The initial idea of growing cut flowers grew after visiting Tregothnan Estate in Cornwall (which has been a pioneer in botany since 1334) twinned with inspiration taken from Sarah Raven, a teacher who runs cookery, flower arranging, growing and gardening courses. 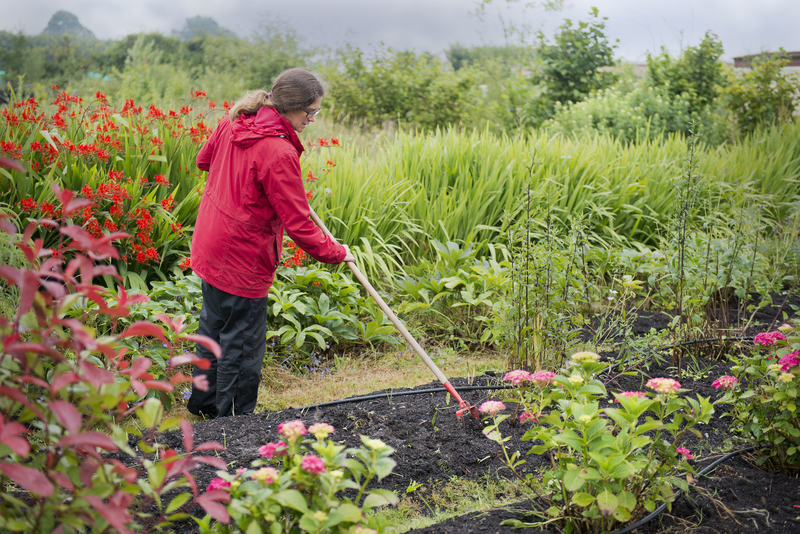 After Jen volunteered at Sarah’s farm in East Sussex, she decided growing cut flowers and foliage would be her future. 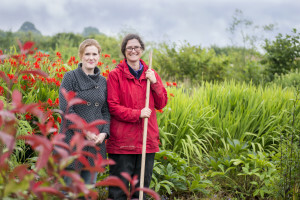 Jen and Bek worked out a business model they both loved and ‘Blooming Green’ was born – based in Loddington Farm which has been in their family for five generations. Picking by appointment has been hugely popular and one of Blooming Green’s avid flower pickers, Thérèse Lang (TJM Associates and Creative Director for GROW London), loved it so much she said “You should do more of this!” so they have. It is a bold move in the botanic world and being the first to offer ‘pick your own cut flowers’ is raising the bar. The experience reconnects people with nature and champions their hand-sown, hand-grown and hand-picked flowers but even so, it is not to everyone’s liking. If you want very specific colours or flower types in your flower arrangements then the florist is best for you, at Blooming Green what you get is cut flowers that have a look of wild, sophisticated beauty – peonies, delphiniums, cornflowers and gypsophila are popular and Jen and Bek encourage you to fill the bucket as full as you can for a very modest price. The experience is designed to be tranquil and Jen tells me: “It should be relaxing, no pressure, and people have the freedom to pick where they like with a huge choice of flowers. We also offer a tea or coffee with biscuit or cake to enjoy.” Jen hit upon one of the biggest selling points for Blooming Green’s pick-your-own experience – relaxation! One of Jen’s happiest moments from Blooming Green so far is remembering when a bride-to-be told her ‘I think that was the most fun hour of my life’. Jen and Bek repeatedly hear from brides telling them picking flowers in their meadow is a great way to escape the stress of wedding planning. It all sounds so fairy-tale but there is a business behind the beauty and making sure there are flowers for people to pick is of course all important. Bek is in charge of growing the flowers and Jen arranges them but both plan the acre plot and get stuck into all jobs. When they first set up, they built upon their knowledge by relying on reference books and advice from those already in the business. Now however, more people are looking into growing cut flowers and Jen and Bek have found that seed catalogues have started to include a scissor symbol next to the seeds for cut flowers – making their seed selection slightly easier. 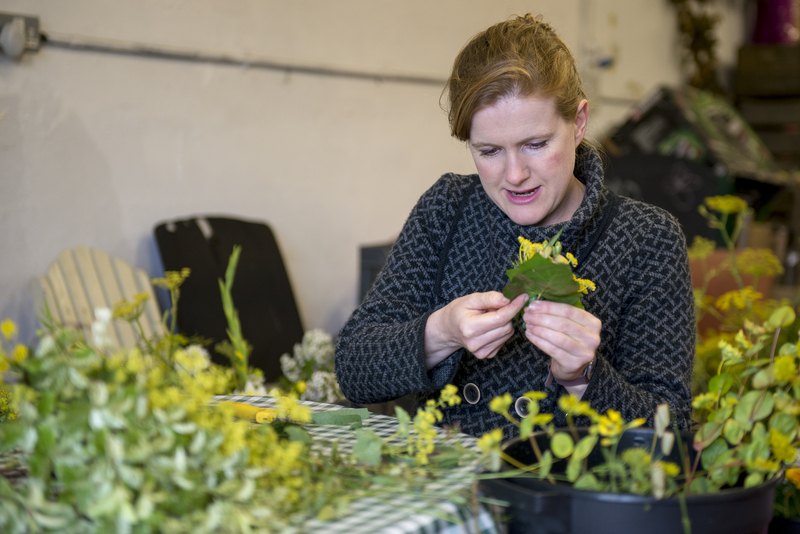 At Blooming Green the year is split into seasons with April-October as the flower selling season, in the winter they plan and prep for the new season and maintain the plot as well as diversifying into areas such as running Christmas wreath making courses and willow weaving workshops. In January there is mainly office work to be done and then from February to April seeds are sown, the plot is prepared and marketing looked into. Blooming Green use the municipal waste collected by the council to feed their plot and they operate a ‘no dig’ policy in the field which means they let the bugs and creepy crawlies do the digging for them, turning the field over naturally. They use water irrigated from a spring in the Greensand Ridge which flows into a reservoir, is pumped to their water tank and then naturally filtered. The business has gone through flux and change including taking the decision to stop their bouquet delivery service. Jen explained that they were hindered by courier problems and invested more money in the venture than they were making back and so that was cut. For both Jen and Bek, Blooming Green is a lifestyle choice and at the moment it doesn’t pay enough to be full time. “We have stuck to our guns in what we want to do and we view it as a lifestyle job. It earns us a living but we are not making it rich!” Jen told me. Flowers hold fond sentiments for many people and it is the scent that can transport you back in time to a vivid memory “Sweet peas will always remind me of weddings” Jen tells me, and she assures me they always include a lot of scented flowers in their bouquets. The company is as environmentally friendly as it can be and although not officially certified organic, they haven’t used chemicals on their flower meadow and whilst that is reassuring it also means bugs are picked along with the flowers, but Jen has a tip for getting rid of unwanted critters and creepy crawlies. “Keep the flowers in a dark room overnight.” she divulges. The types of flowers and arrangements Bek and Jen create at Blooming Green are unique and the variety of cut flowers they are growing is quite astonishing. You can find a full list of the flowers here http://www.bloominggreenflowers.co.uk/what-flowers-will-i-find. You won’t find similar flowers on the high street or in the florists. “I go to a lot of weddings and you get people who spend £10,000 on flowers and no one remembers them but they spend a fraction of the price with us and everyone remembers them” Jen tells me. 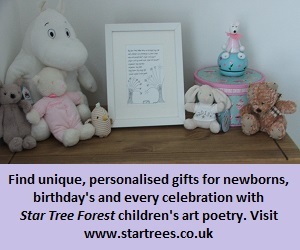 For more information go to http://www.bloominggreenflowers.co.uk/ Twitter:@bloominggreen1 or follow Blooming Green on Facebook and Pinterest. 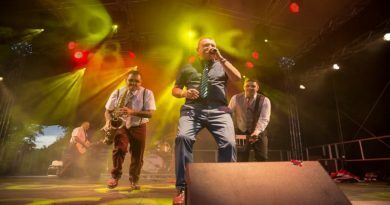 Address: Blooming Green, Loddington Farm, Linton, Kent, ME17 4AG Tel: 01622 298676. Next open day 6th September. ← Behind the Scenes with Kent Veg Box – 75% discount to Inside Maidstone readers!